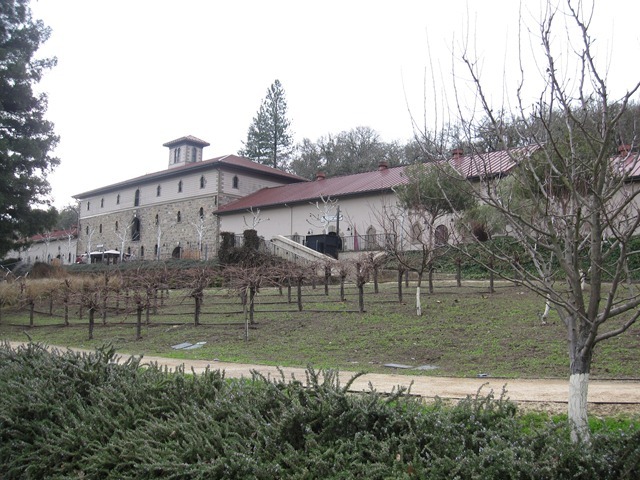 The classy Beringer Vineyard is a large winery in the heart of the Napa Valley. There are lovely views out over the valley and their grounds, but unfortunately no picnic tables to enjoy it from. We wound up eating lunch on the benches in front of the tasting room. Not bad, but not the ideal spot either. There isn’t any shade, either. Not a problem on the day we visited, but in the middle of the summer it might be less pleasant. They offer several different tours of the winery with prices ranging from $15-$40 per person. They have different tasting rooms – we chose to visit The Old Winery Tasting Room where it was $10 to taste 3 wines. 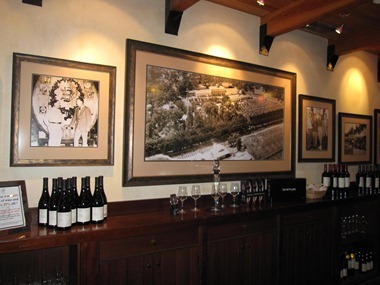 There is a long wooden bar and the room was decorated with large, framed, black and white photographs of famous people visiting the winery. We sampled a variety of different wines – everything from red to white to sparkling rose! We particularly enjoyed a Gewurzaminer and the lovely 2008 Premier White Zinfandel – mildly sweet with a fruity clean finish – we can see it pairing very nicely with some spicy food. The winery is open daily – except Thanksgiving; Christmas and New Year’s Day. Beringer Vineyards is located at 2000 Main Street , St. Helena , California in the heart of the Napa Valley.